The axe on the left is the author’s and has had 10 years of solid use. 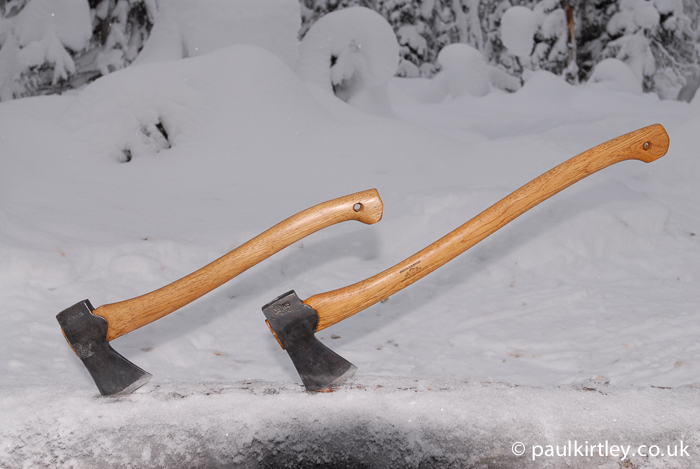 The axe on the right is the same model – a Gransfors Bruks Small Forest Axe – but only a year old. The difference is down to care and maintenance. Photo: Paul Kirtley. Many people spend more on a good quality bushcraft or survival knife than they do on an axe. In an environment where an axe is important, it is often as valuable if not more valuable than a knife. For example, in the northern, or boreal, forest where trees grow slowly and the wood is dense and knotty, an axe is your primary cutting tool. In any woodland where you were working on larger projects that require substantial sections of wood, being able to fell and process both live and dead standing wood is something for which you need an axe (and possibly a saw). A good quality traditional-style axe will likely have a wooden handle, or helve as it is sometimes still referred to. As with any wood that is kept or used outdoors, it needs to have some protection from the elements, most notably water. When you buy a new axe it comes with a protective finish on the handle. This finish is often made from linseed oil and beeswax. 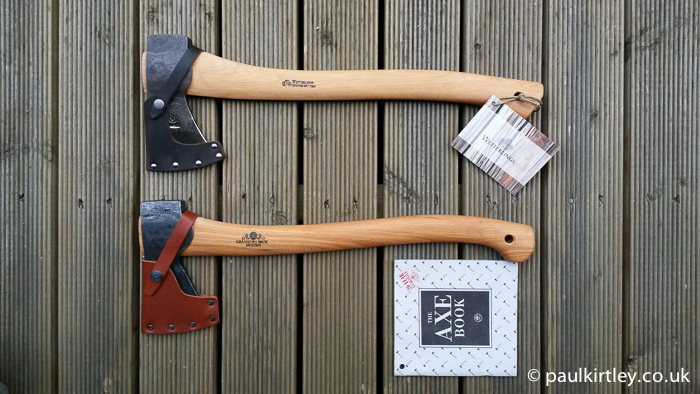 Axes such as the Wetterlings Outdoor Axe (top) and the Gransfors Bruk Small Forest Axe (bottom) come with a factory-finished wooden handle. But this finish must be maintained to protect the wood over time. Photo: Paul Kirtley. Keeping your axe in prime working condition does, of course, include keeping it sharp. I’m not, however, going to cover axe sharpening in this article. What we’re concerned with here is how to keep your axe in good condition and protected from the environment. 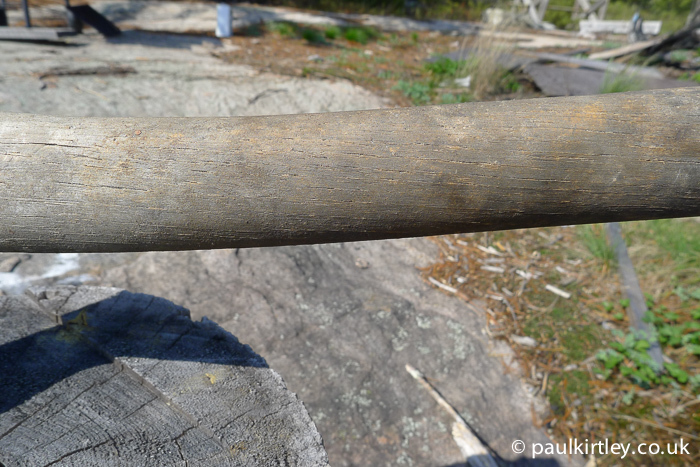 The axe head of a good quality axe such as those made by Gransfors Bruk is typically made of steel that is not stainless. That is, it will quite easily rust if allowed to remain damp for a period of time. This would obviously have a detrimental effect on both the finish and ultimately the longevity of the axe head. So, we must protect against moisture. The easiest way to do this is to oil the axe head. Some oils are better for this than others. In the absence of the ideal, anything is better than nothing. A general purpose oil which I have been using in recent years is Ballistol. This can be used on the leather of the axe mask too if needed. It’s also good on wood. As a general purpose non-toxic oil it’s a good one to carry as a one-stop shop for keeping most of your gear that needs it, including all the parts of your axe, in good shape while on a trip. I’ve also found various gun oils good for creating more of a dry finish on the axe head. When oiling the axe head, first remove the mask then apply a thin layer of oil all over the metal of the axe head. Remove any excess with a cloth. Leave the oil to dry off to the extent it will before refitting the mask. This hickory axe handle has been exposed to the elements for an extended period of time. The factory finish has all but gone and the wood is beginning to crack in places. Photo: Paul Kirtley. Once you’ve coated the entire handle reasonably liberally, take a rag or some kitchen towel and remove the excess. This should now be a thin layer of linseed oil left remaining on the handle. This can then be left to dry. This simple process provides another very fine layer of finish to the handle and increases its level of protection from the elements. Over time if you keep adding single layers, you will build up a very good and resilient layer of finish on your axe handle. Warning: Please note that rags or pieces of cloth soaked in linseed oil can spontaneously combust if left scrunched up and should not be left indoors. The potential for serious fire is well-documented. The best solution – where safe to do so – is to burn the rags. The second-best solution is to leave them hanging outside, unfolded to dry before disposing of them. If you have a mask that is made of leather it will need to be cared for. You must remember that the mask is designed to protect you and your other equipment from the sharp edge of the axe bit. The mask must retain its original good fit. You do not want the mask to become loose or to fit sloppily. Therefore, you shouldn’t apply any treatment that will soften or allow the leather to stretch beyond its original size and shape. There are a number of easily available products that can be used to treat your axe mask. Personally I use Nikwax Aqueous Wax. To apply this to the axe mask removes the mask from the axe and use the applications are to apply a liberal amount to the mask, not forgetting the welt. Leave the wax to dry, then rub it in with a damp piece of kitchen towel or cloth. This last action creates a shine and protective finish. 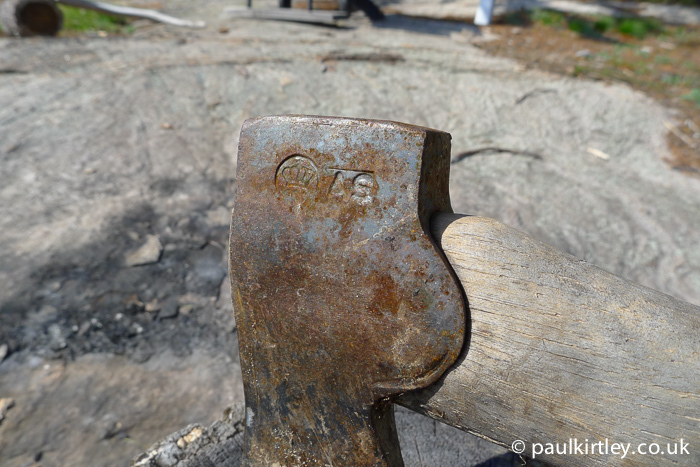 An axe proving it’s worth in the boreal forest, in the far north of Scandinavia. Photo: Stuart Wittke. I have a walnut oil / beeswax mix and have used it on my axe for a while. In your opinion, is this a good long term product to use on the head and handle? Yes, I think that’s a good one-stop-shop solution for handle and head. You could even use it on the mask. BUT a couple of contraindications – 1/ don’t lend your axe to anyone who has a serious nut allergy and 2/ be careful in bear country as it may smell tasty. A couple of very valid points to bear in mind there. Thank you for sharing this article. I just followed those steps. But I have a question. Is that okay if I use the Boiled Linseed Oil on the head of the axe? 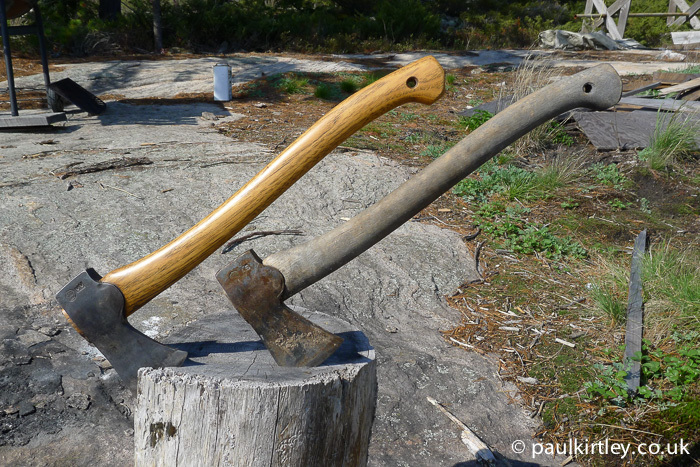 Boiled linseed oil will not do any harm to the axe head. Thank you for the answer, Paul. Another good article as ever. What about using WD40 or equivalent on the blade, it dries ok and doesn’t leave a sticky residue? WD-40 is a good option for coating your axe while stored at home or before you head out on a trip. As you know, it is very effective in protecting metal surfaces from moisture. I tend not to use it on trips, however, as the delivery method is via a reasonably large aerosol can, which I would not want with me on a trip. I prefer to take a small dropper bottle of oil with me on a trip. Did you know that WD stands for “water displacement”? Thanks for the blogs and videos, all excellent stuff (music a bit spooky on the fire drill bow vid though). Ok, I use WD 40 at home to clean the whole axe, then a thin wipe with olive oil. Seems to do the trick these last three years, and I’m not in danger of bears, only government interference! The mask I generally wipe clean after a trip, and treat with a leather feed/restorer type product. Hi Paul, Thanks for another useful piece of information. I bought a large axe from a farm equipment sale.Unfortunately I think someone may have used it as a wedge as the back of the head is mushroomed slightly. On the good side the whole axe appears to have been coated in some sort of heavy agricultural engine oil. There is no rust on the head and the helve is smooth and split free. The only downside to the engine oil is the strong smell and the “stickiness” of the shaft. I have tried rubbing away at the wood with old towelling, but I think I may have to sand it back. Thanks, one more tine, for this very interesting article. Concerning the oil application, when i re-handle one axe with a new shaft, i try to impregnate it deeply by either soaking the full axe (blade protected with a film or wax) in a bath of boiled linsen oil during few days till one week, or, if i have not enough oil available, i treat the shaft with several generous applications, on few days (one per day for exemple), observing carefully it and checking if the wood is absorbing the new oil input. I repeat said application till i see that wood is “saturated” and therefore can not anymore absorb oil. It is especially easy and interesting to see that on the cross section of the shaft embedded in the eye of the blade. Then, after removing the excess of oil, i let it “harden” few more days: the oil is polymerized at the surface but also in the saturated fiber of the wood (at least few fractions of millimetres depth under the surface) for making a bit denser said surface and bringing a quite good water resistance/or render said surface at least partly un-wettable. Warm regards and again thanks for all. 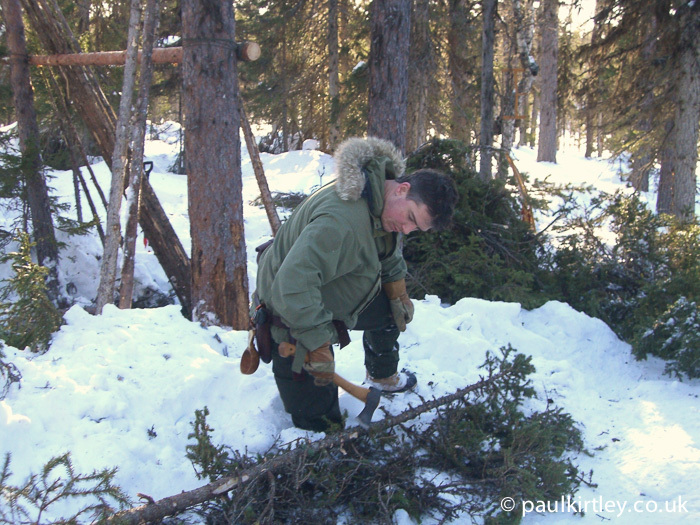 I was wondering if you know about using an axe with a high quality steel in very cold temperatures, I have the Wetterlings bushman axe, and in the leaflet that came with it it said that in the cold winter the forest workers used to warm the head of the axe against their bodies before they used them, presumable because the cold temperatures made the steel more brittle and more likely to chip or fail. Have you ever heard about this? First Let me to say that I love this tool! Even if I have little use in my environment I own a small forest bruks axe and a scandinavian bruks forest axe!! About axe care normally I start with the handle by rubbing a raw linsed oil shorted in half with turpentine; this recipe allow to deep soaking the raw linseed oil into the wood with no stickness at all. I do pass the mix sever times since I see the wood itself stops to absorbing oil and then I remove the excess: I prefer raw linseed oil above the cooked one just because it is more ecofriendly product as there no metal drier in it, but it is just my way to do, only my point of view. About the axe head me also using the ballistol oil from some time and it is very good in my opinion. On the axe mask I rub a beeswax/linseed oil/turpentine mix and let it dry but if I’m on the rush I go stright with ballistol. I was happy to find this article appear on your blog about the same time I set about to refinish and rehaft my grandfathers old axehead. It is now rehafted, descaled, polished (to a reasonable degree for a tool I plan on using regularly) and am in the process of making a leather mask for it. The only commentary I had is about linseed oil. If left in a cool dry place, it will in fact polymerize after a week or so. As an avid spoon carver, I have finished all of my spoons (a few hundred by now) by soaking for a few days, then allowing to dry for a week or two (depending on the wood type) and then they are ready for use. Just a comment on an excellent article. I read your blog and watch your videos regularly to keep up my bushcraft game and I thank you for everything you do. I hope someday to be able to afford to fly to your part of the world and take a course. Any soloutions for a loose mask? I favour food grade coconut oil for my carbon steel knives, tools and leather on extended trips for several reasons. You can eat it, fry, make yummy coconut flavour bannock etc, to save carrying multiple containers of oil where weight is an issue on portages. At most times of the year it will remain as a solid white waxy consistency so less likely to leak in your pack. For a food preparation knife I would not wish to consume small amounts of oil residue from Ballistol, gun oil etc. It melts on your fingers at skin temperature and can be worked into leather very much like nikwax into boots. It also sticks well to cold steel in storage inside sheaths and axe masks. I hope this helps somebody?